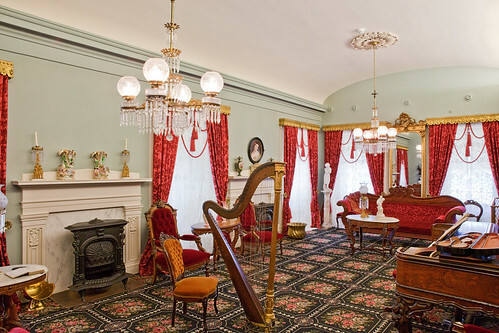 Elegant sitting room in the Beehive House, Salt Lake City, Utah - Brigham Young's residence until his death in 1877. This photo was processed from the camera RAW, along with three adjustment layers in Photoshop to control local contrast and shadow detail. See the straight, camera JPEG below for comparison. This is a digitally enhanced image (see the original image below). Click on image for a LARGER view. Click here to see other "Photo Fix it Studio" examples.